Directions: Rt. 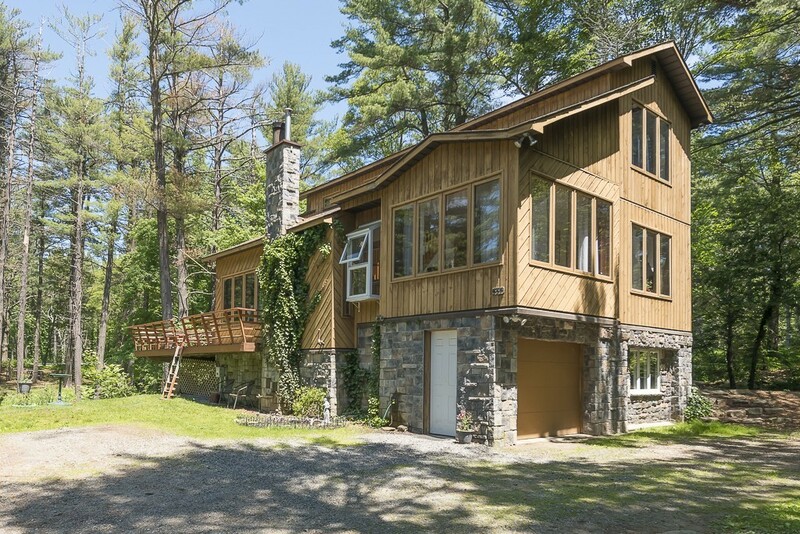 133 To Harlow St. To Concord St.
Dappled light and whispering pines welcome you to this fabulously sited, private retreat for you and your horses. Featuring rows of windows and generous decks, this bright, light filled, contemporary home with a 3 stall horse barn (768sf) AND an outshed on 5+ acres offers plenty of space for horses and owners alike. The cathedral ceiling living room is spacious and charming with views of the land and stable in the distance and a floor to ceiling wood burning fireplace. The master bedroom is on the main living floor, with two bedrooms on the second floor. The walkout basement offers the 1 car garage space, a 3/4 bath, two private rooms (currently set up as bedrooms) and plenty of room for storage. The barn features 3 oversized stalls, water and electricity. There is a grain room and large loft with a conveyor belt. Minutes to Conomo Point and Wingaersheek Beach. bedrooms), storage, systems and garage.